Diffraction effects limit the resolution of conventional optical microscopy to about 200 nm. Numerous techniques have been invented to overcome this barrier and allow visualization of biological structures at the sub-cellular level with unprecedented clarity. However, these so-called super-resolution methods typically require complex, costly purpose-built systems, involve image post-processing and struggle to achieve sub-diffraction imaging in 3D. Thus, their practical application is still quite limited. 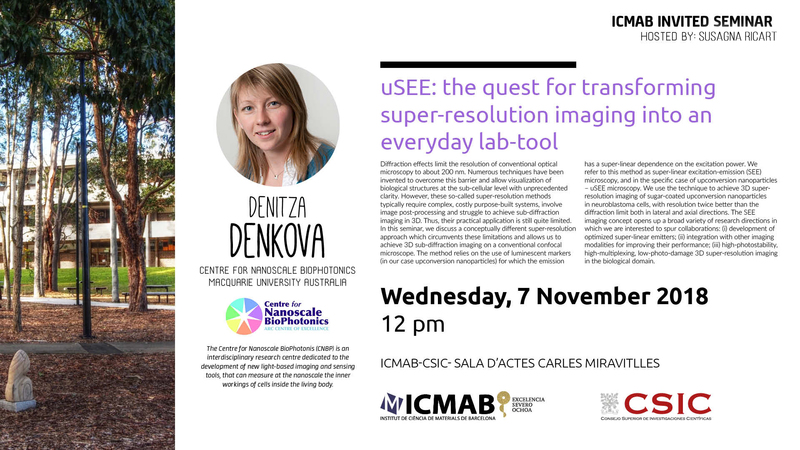 In this seminar, we discuss a conceptually different super-resolution approach which circumvents these limitations and allows us to achieve 3D sub-diffraction imaging on a conventional confocal microscope. The method relies on the use of luminescent markers (in our case upconversion nanoparticles) for which the emission has a super-linear dependence on the excitation power. We refer to this method as super-linear excitation-emission (SEE) microscopy, and in the specific case of upconversion nanoparticles – uSEE microscopy. We use the technique to achieve 3D super-resolution imaging of sugar-coated upconversion nanoparticles in neuroblastoma cells, with resolution twice better than the diffraction limit both in lateral and axial directions. The SEE imaging concept opens up a broad variety of research directions in which we are interested to spur collaborations: (i) development of optimized super-linear emitters; (ii) integration with other imaging modalities for improving their performance; (iii) high-photostability, high-multiplexing, low-photo-damage 3D super-resolution imaging in the biological domain. My research interests are in the area of imaging techniques, with focus both on fundamental science and on applied interdisciplinary or academia-industry collaborations. I completed my Bachelor (2008) and Master (2010) studies in physics at Sofia University, Bulgaria. Simultaneously, I was working part-time as failure analysis and customer quality engineer at a microelectronics company with focus on automotive industry – Melexis. In 2010, I moved to KU Leuven (Belgium) for my PhD, where I focused on developing and applying a technique for imaging with sub-diffraction resolution the lateral magnetic field of light for plasmonic and metamaterial applications. In search for novel imaging methods and applications, after completing my PhD (2015), I moved to Sydney, Australia. There, I joined the Centre for Nanoscale BioPhotonis (CNBP), which is an interdisciplinary research centre dedicated to the development of new light-based imaging and sensing tools, that can measure at the nanoscale the inner workings of cells inside the living body.